1 What is the pH balance scale? 1.1 How do you measure your own pH? 1.2 What can pH mean for fertility? 1.3 How can you keep your pH level in check? Today’s blog takes you all the way back to your high school chemistry class. Bet you didn’t think you’d ever need to know any of that stuff ever again, and you surely didn’t think anything you learned there could impact your fertility, right? Well, it does! 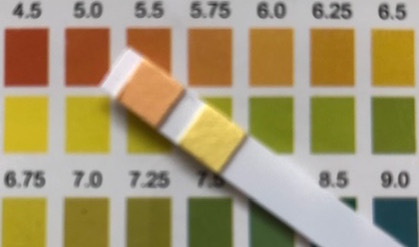 The concept of pH balance is very relevant for your fertility and it’s worth the refresher on what pH balance is and what it means for your health and fertility. 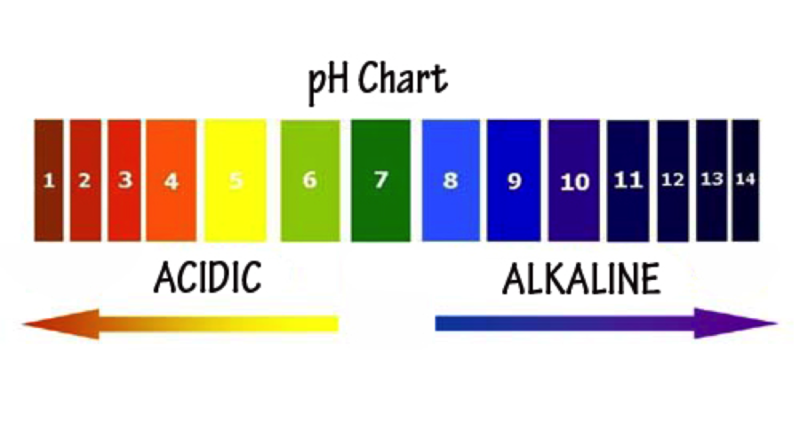 In chemistry, pH balance means “potential of hydrogen” and it’s a numeric scale that’s used to specify the acidity or alkalinity of a solution. In plain English, that means that pH is a tool that can tell you if you’re prone to getting sick. It gives you information about your fertility as well! Our internal constitution is constantly changing and sometimes the changes are really subtle but can have a big impact on our health. This all happens at a cellular level. Since our bodies function at their best when they’re in balance, it’s important to maintain a healthy balance of acidity and alkalinity in our body’s internal constitution. The pH balance scale gives us a great tool to do that. This all happens at a cellular level, meaning that paying attention to our body’s pH can give you great insight on what’s happening inside your body. An when you have an idea what’s going on inside your body, you can be on the lookout for potential issues and address them head-on if and when they arise. And you know me – I love when we can be proactive in managing our health, managing our fertility, managing our life! What is the pH balance scale? The scale measures from 1-14, with the midpoint of 7 being the neutral zone. A healthy body is slightly alkaline, and for optimal health, our body should be at a pH of around 7.3 – 7.4. That’s the green zone on the chart below. Green is good! Anything below this on a regular basis and we are in the red zone on the chart – too acidic and more prone to chronic illness and disease. Can you be too alkaline? Yes. Too much alkalinity has issues too. If we’re too alkaline, some of our body’s functions may not work correctly, like metabolizing food or using water efficiently. 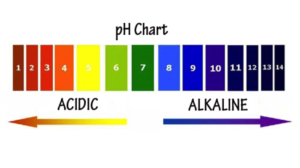 With all the emphasis on acidity, we sometimes forget that the pH scale is exactly that and you want your level to be close to the middle to achieve balance. How do you measure your own pH? What can pH mean for fertility? In addition to being a barometer of overall health, which has a huge impact on fertility, pH can affect the quality of your cervical fluid. Simply stated, when your body is too acidic your cervical fluid will be too, and this creates a hostile environment for the sperm and impede their ability to get to where they need to go to fertilize the egg. Sperm need an alkaline environment to perform at their best! So watching our pH is important particularly around the time of ovulation, and throughout the entire menstrual cycle. How can you keep your pH level in check? I’m so glad that you asked! Not surprisingly, one of the most effective ways to keep pH in line is through the diet. You are what you eat, right? Just as people do, foods have their own properties of acidity and alkalinity. If you regularly eat a lot of foods that are highly acidic, eventually your body is going to adopt that state as well. It will take some time but eventually you’ll be more prone to chronic illnesses, you won’t be as immune to daily toxins, and you’ll probably notice that you get sick more often. A lot of what we eat in modern society is highly acidic – things like dairy, red meat, sugar, fast food, and alcohol – so it’s no wonder that we as a society seem to be getting sicker and sicker. 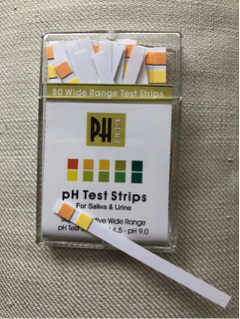 Test your pH level regularly. The test strip kits from Amazon are cheap and easy to us. It’s a great resource and gives you so much useful information. I recommend testing at least once a month to get snapshot of where you’re at. If you find you’re leaning acidic, you can implement some of the other suggestions below. Create daily rituals around restoring alkalinity to your body. Two of the most effective rituals I recommend take just minutes a day. Lemon Water. Drinking a glass of room temperature water with half a lemon squeezed into it upon waking not only gets you started on your water intake for the day, it helps to balance and alkalize your tissues. Apple Cider Vinegar. Taking a teaspoon of apple cider vinegar every day helps to build your immunity and also serves to balance and alkalize your body. You can dilute the vinegar in our water or take it straight, like a shot. Both rituals seem counterintuitive, as lemons and vinegar seem they’d be acidic, but they have alkalizing properties for our body and are incredibly beneficial. Manage or reduce stress. Stress is highly acidic and excessive stress can lead to greater acidity in our body. While it’s not realistic to expect to be able to completely eliminate stress from your life, you can find ways to reduce stress and better manage the stress that you do have. Having a mindfulness practice goes a long way to helping manage stress, and is well worth the effort. Periodically cleanse your body to remove toxins. I recommend cleansing seasonally. I’ve done a 7, 10 or 14-day cleanse almost every season since 2012, except when I was pregnant and nursing. Read more about how cleansing helped my fertility journey here. Cleansing is very safe (and recommended!) while trying to conceive, and cleaning the inside of our body – purging harmful toxins – goes a long way toward restoring our own natural balance and alkalinity.